As synthetic turf companies improve manufacturing techniques, painting and maintaining it has become a whole new ball game. We’ve put together a four part series to help keep you up-to-date. Painting synthetic turf has become quite an art form. It comes with a medium that is ever changing and evolving. In the early days of synthetic turf, there were only a few options to worry about which made life easy. You either had monofilament or slit filament, poly fibers or nylon fibers; from there you just painted accordingly. 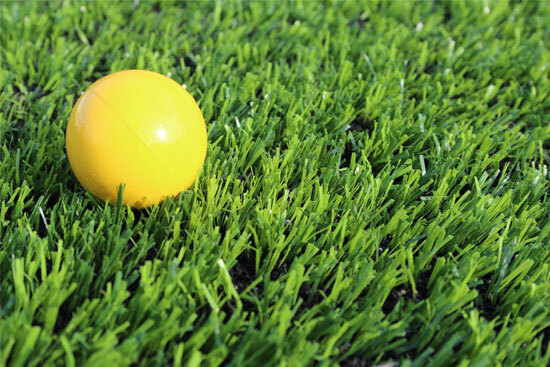 However, as turf companies improve manufacturing techniques, painting synthetic turf becomes a whole new ball game. There are many factors to take into consideration when it comes to painting synthetic turf these days. Like people, no two fields are exactly alike. 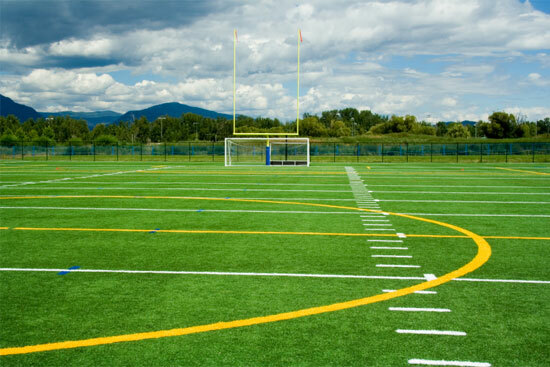 Because of all the new trends and innovations in synthetic turf, there are a lot of things to take into consideration when purchasing a new field. Even if you decide that painting isn’t for you, and you go with inlaid or sewn in lines, it doesn’t hurt to plan ahead for unforeseen rule changes or newly added sports down the road. The first step is to know who manufactured your turf. There are many great companies out there, and knowing the manufacturer will make painting a whole lot easier. No one knows more about your specific field than the company that produced it. Each turf company has their tricks of the trade which help to make each field unique. With so many fiber shapes and lengths, material blends and infill mixtures out there, being aware of where your turf comes from is the basis for knowing which paint will work best for your situation. Next, going hand-in-hand with knowing who manufactured your turf, you need to know what style your fibers are and what they are made of. Paint sticks to various materials differently, as it also does to different fiber shapes. 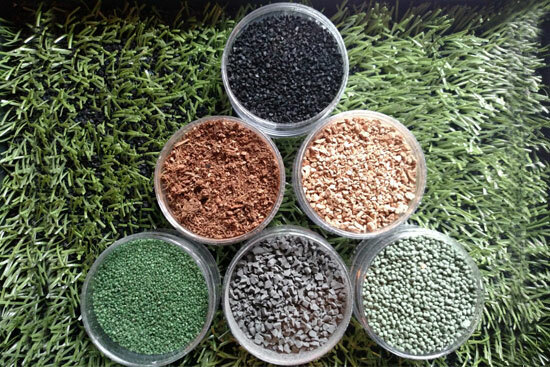 For example, nylon turf is more rigid, while polyethylene fields have flexible fibers. A paint that may work really well on a flexible blade of turf may flake off a more stiff fiber. Brace yourself; this is only the beginning. With new fiber shapes popping up all the time, working with removable turf paints also becomes more involved. Blades of turf have a lot more nooks and crannies than they used to. Fibers, which once only came in straight blades, can now be seen in shapes such as triangles, tubes and corkscrews. Another essential aspect is to know the type of infill your turf has. Similar to fiber types, paint adheres differently to different infill materials. Although still the most commonly used infill on the market, SBR rubber is not the only filler on the block any more. With companies trying to address safety concerns and be more environmentally friendly with organic and recyclable materials, manufacturers have come out with numerous new ways to infill turf. Some common new infills include: cork, TPE plastic, coconut, EPDM natural rubber, coated sand and corkconut (a mix of cork and coconut). Lastly, knowing what is under your turf will also help you develop the best practices for applying and removing paint from your field. Over the past several years a popular component to synthetic turf is laying down an E-Layer between the base layer and turf itself. An E-Layer is a rubber pad that helps to stabilize the turf and provides cushioning to keep your Gmax (surface hardness) in check. Preventing paint from building up in this layer is a little trickier, but if done the correct way, can help add years to your turf system. Join us over the next few weeks as we delve deeper into fibers, infills and E-layers. We will break down and explain how each of these components work, and have transformed over the years, in order to help you build a paint and care program for your field. Part 4: What’s an E-Layer?